Eremobates sculpturata Muma, 1951: 39, 40 (fig. 14), 82-84 (figs. 134-138); Muma 1962: 2 (Fig. 5), 6, 7; Muma 1970a: 29; Muma 1986: 10; Muma 1987: 10; Muma, 1989: 15; Brookhart & Brookhart 2006: 305. Left: Adult male with right chelicera removed. Right: Right chelicera of male. Click HERE for additional images archived under the Camel Spiders of North America faunal project on the Symbiota Collections of Arthropods Network. Medium-sized eremobatine solifuge with shovel-like termination of fixed cheliceral finger (see above), six needle-like ctenidia on first post-spiracular sternite, and without a palpal scopula. Differs in the latter two features from E. drachmani (the only other known member of the genus), which bears four ctenidia and a palpal scopula. Male holotype from Arizona, 1923 (Mr. Ortembery), no further data, in the American Museum of Natural History. 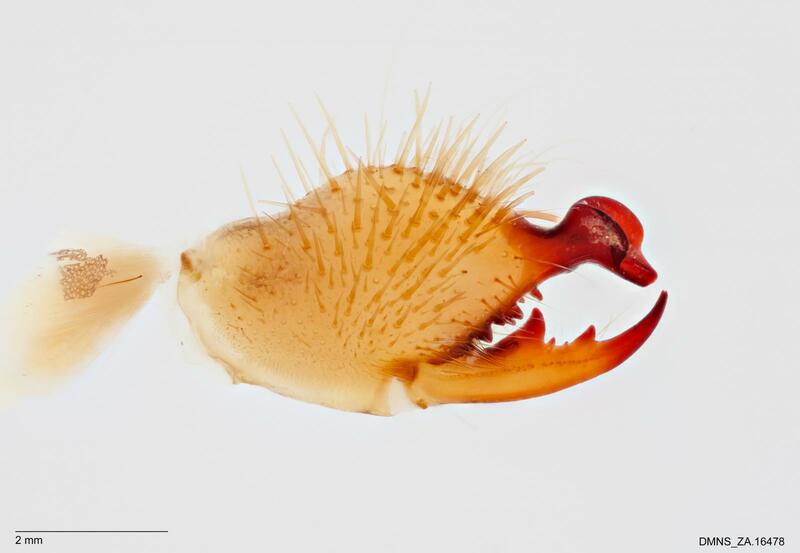 Male paratype from Alamo, Arizona, no further data, in the collection of Cornell University. Coloration in alcohol light to straw yellow, with dusky purplish markings as follows: chelicerae with one lateral and two dorsal dusky stripes which are more distinct towards the base; eye tubercle dark; propeltidium dusky, darker on the anterior margin, with two light areas at the postero-lateral corners and a thin light median stripe, mesopeltidium, metapeltidium, and abdominal tergites dark; distal ends of femora and proximal ends of tibiae of fourth legs faintly dusky. Malleoli white. Dentition of chelicerae as shown in figures 134 to 136. Movable finger with large principal tooth, an anterior tooth about half as large as the principal tooth, two intermediate teeth, of which the proximal is considerably larger, and a distinct mesal tooth. Fixed finger a short, squarely blunt, shovel-like structure with two large, rounded, flange-like lobes, forming the lateral shoulders. Fondal notch obscure but carrying two small and one large denticule. Mesal groove of fixed finger and flagellum complex same as for genus. Mesal setae of movable finger plumose on the basal third of the articulation area but simple distally. Eye tubercle situated on the anterior margin of the propeltidium. Eyes separated by about one diameter. Propeltidium wider than long by a ratio of 1 to 1.7. Metatarsus, tarsus, and tibia of palpus provided with numerous cylinder bristles, but there is no scopula on the metatarsus. Metatarsus of palpus about three times as long as tarsus. First post-spiracular abdominal sternite provided with seven elongate, hair-like ctenidia, one of which appears to be spurious." "REMARKS: This striking species differs greatly in the peculiar structure of the fixed finger from any other species of Eremobatidae seen. Otherwise it appears to be a species of Eremobatinae." "RECORDS: Arizona: Carr Canyon, Huachuca Mountains, June 3, 1953, one female (Cazier and Gertsch); Yuma, North Yuma Valley, August 14, 1957, one male (Louie Arviso); Yuma, September 14, 1956, one female (V. Roth), August 30, 1957, one female (V. Roth); Yuma County, Little Horn Mountains, one young female. REMARKS: The female of this species has not been described, but rather than confuse the literature with possible synonyms I record the above specimens here, pending the collection of associated males and females of this genus. The epigynum of the Yuma, August 30, 1957, specimen is shown in figure 5. This species has been recorded only from Arizona. " "Eremothera sculpturata Muma, 1951, p. 82. DIAGNOSIS: Males are distinguished by 6 elongate hairlike ctenidia and no palpal scopula. Females have pale palpi and parallel opercula. The species is adequately described in Muma (1951). TYPE LOCALITY: Male holotype from Arizona, 1923, by Mr. Ortembery, in AMNH. date the sexes have not been collected together. " Male holotype from Arizona in AMNH. Distribution: North America (Arizona) and Mexico (Sonora), four records of males and females. " "Eremothera sculpturata Muma, 1951, p. 92; Muma, 1970, p. 29.
tooth on the movable cheliceral finger." "Eremothera sculpturata Muma, 1951, p. 82; Muma, 1970, p . 29. Following record extends range of species in the United States into northern Arizona. One male collected 6 mi. N of Wickenburg, Arizona, August 13, 1976 indoors by T.
Type material.—Male holotype from Arizona, USA, no further locality data (AMNH). Recorded specimens.—Known from type and 3 males. 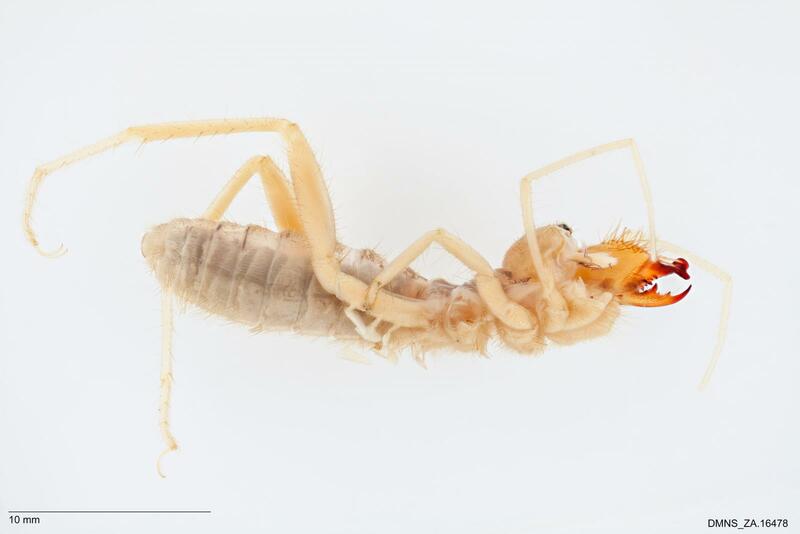 Images of the undescribed female are available on the Symbiota Collections of Arthropods Network, and can be accessed by clicking here. This species has been found to co-occur with Eremothera drachmani in Catalina State Park, Pima County, Arizona. The known distribution of the two species is similar.